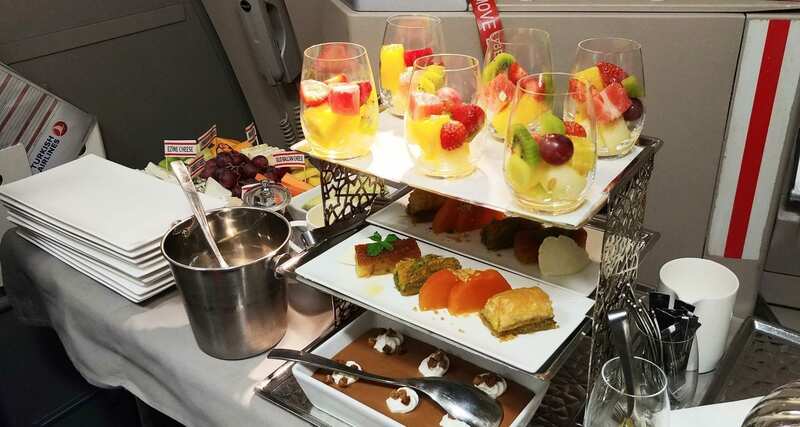 I love flying with Turkish Airlines, you always know that you will have a tasty, decent and quality inflight meal regardless of which cabin you fly in. I only recently wrote about their inflight meal experience in business and economy class right here. I wasn’t expecting to fly with them so soon, but I ended up flying with them in early December for a trip from Athens to Montreal. But more about that a little later, aimed with my trusty note pad, timer and eagle eyes I set out to see exactly what services the crew offer on these flights. First up I visited the Aegean Airlines lounge in the Non-Schengen departure area of Athens Airport. Turkish Airlines does not have a lounge at Athens Airport however their Star Alliance partner lounge was more than adequate. The lounge opened in December 2017 and offered a fantastic Nespresso machine, freshly pressed juice, yoghurt and an assortment of snacks. 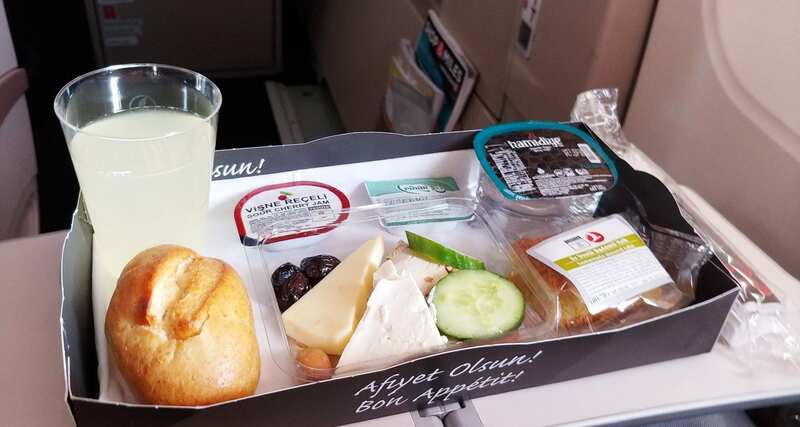 Athens to Istanbul was a quick 1-hour hop; the cabin crew completed a service which included this fantastic little picnic offering, and of course you had a choice of drinks also. Tip: Always ask for the Turkish Lemonade! This meal of fresh olives, cheese, chicken and tomato along with a piece of Almond cake was more than adequate for this flight; it was fresh and delicious. Certainly very decent when compared to what you may receive on similarly timed flights with other European carriers. After a transit and a visit to the Turkish Airlines lounge in Istanbul (see video below for the experience) it was time to board my flight to Montreal. A choice of pre-departure drinks included: Berry, Orange or Lemonade, I opted for the Lemonade. The Inflight Chef then came through to deliver inflight menus to everyone; he then took everyone’s’ meal orders before take off. He took the time to explain each of the meal choices and genuinely wanted people to be happy with their decision. The flight was scheduled to depart at 1545 local time, with a flight time of about 10 hours, we left just after 1610. Right after take off at 1625 the crew distributed hot towels to everyone. Rose Saraplar (2017) from the Aegean Region in Turkey. White Wine Prestige Narince 2016 Turkey, Sarafin Sauvignon Blanc 2017 Turkey, Chablis Domaine Daniel Seguinot 2017 Burgundy France. Red Wine Sevilen Plato Syrah 2015 Turkey, Suvla Sur 2013 Turkey, Chateau Lamonthe Pontac 2016 France, Bodegas Beronia Crianza 2015 Spain, Bodega Norton Provada 2014 Argentia. Port Wine (2012) from Portugal. Whiskey Chivas Regal 12 years, Ballantine’s Blended Scotch 12 years, Glenfiddich Single Malt 15 years and Jim Beam bourbon Black. Plus Absolut Vodka, Beefeater Gin, Teridag Raki, Grand Marnier, Bakers Field Cream, Sour Cherry Liqueur, Hennessy Cognac, Efes and Carlsberg beers. Black Tea, Herbal Tea, Relaxing tea, Digestive Tea, Energy Tea, Detox Tea, Winter Tea, Anti-bloating Tea, Comfort Tea. Chocolate Milk, Coke, Mineral Water, Ayran, Orange, Tomato, Lemonade. Instant Coffee, Filter Coffee, Espresso, Cappuccino, Turkish Coffee and Hot Chocolate. 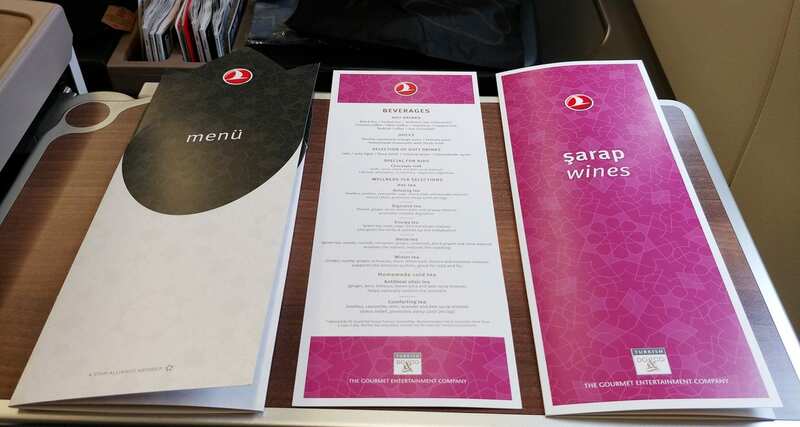 On today’s flight, there will be two meal services, and you can see all the meal options above on the inflight menu. There are eight different entree options and three main meal options to choose from for the first meal service. 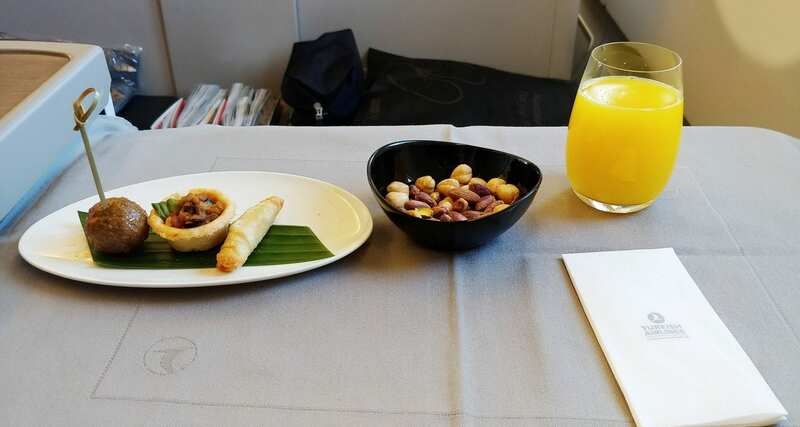 After the hot towels were collected the cabin crew took drink orders for the entree service, and then prepared your meal tray with the cloth, and delivered your drink order and some nuts. The chef then offered your amuse bouche. Once I finished my amuse, the cabin crew cleared everything from my tray. Meal tray set up would be completed again by the crew from the main service trolley. Ready to start sampling from the entree trolley! This set up was completed at 1710, just one hour after take off. I like the side dish of oil, spices, butter, bread and those cute little Salt and Pepper shakers. Everything sounded amazing, so I told him that I was happy for him to select them for me, and the entree did not disappoint. My entree was fresh and prepared with quality ingredients. I couldn’t fault any of these starters; my favourite was the smoked eggplant, it was truly delicious and the smokey flavor really hit the spot. It was now 1800 and time for the main meals to be served, I opted for the Turkish Manti, it was a dish that so many people recommended I try. However, I also managed to get some photos (and videos) of the other dishes. The Manti was remarkably good; I am pretty sure that it’s still hand made by the airline’s caterer Do&Co. Manti is a dough based product that is rolled out and filled (in this case) with Beef, boiled and then served with a tomato and yoghurt sauce. It’s a bit like ravioli, but so much better. To see how it’s made view the video below from the Turkish Airlines Twitter account. Now I didn’t sample this meal; I took a picture of the finished product so you can see it. Beef Teriyaki. And here’s a look at the Grilled Fillet of Salmon. I finished my main meal by about 1825 and then it was time for dessert, the dessert service started at 1845. I asked for the fruit to try and feel better about myself for eating that chocolate mousse. At 1915, I retired to bed, the service was complete, and the cabin lights turned off. 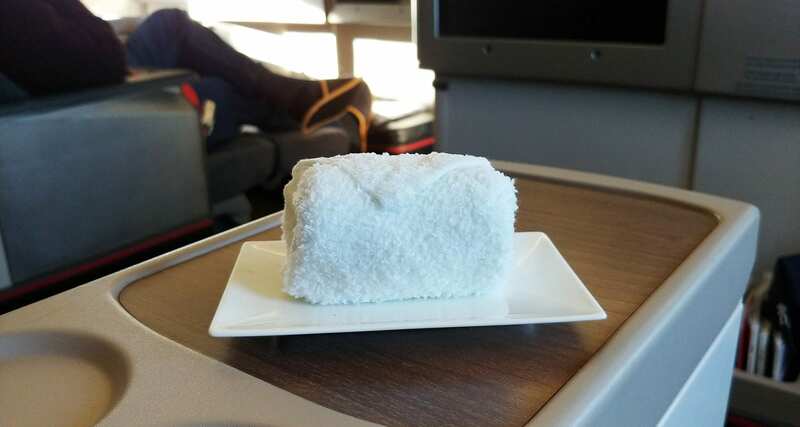 Two hours before departure it was time to eat again, the cabin lights were turned up, and everyone offered a hot towel. I opted for the Eggplant, and it was a great choice indeed. The entire second service took only 35 minutes for the crew to complete, it was quick but didn’t feel rushed at all. 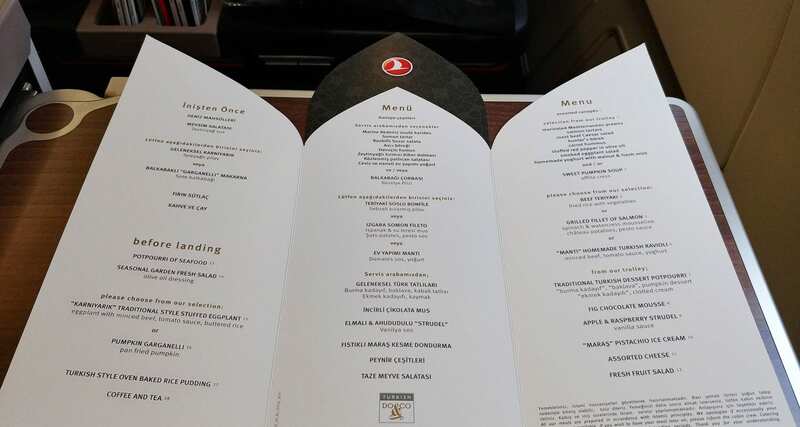 As always my meal experience on Turkish Airlines was spectacular in business class, and the short economy hop was also pleasing. 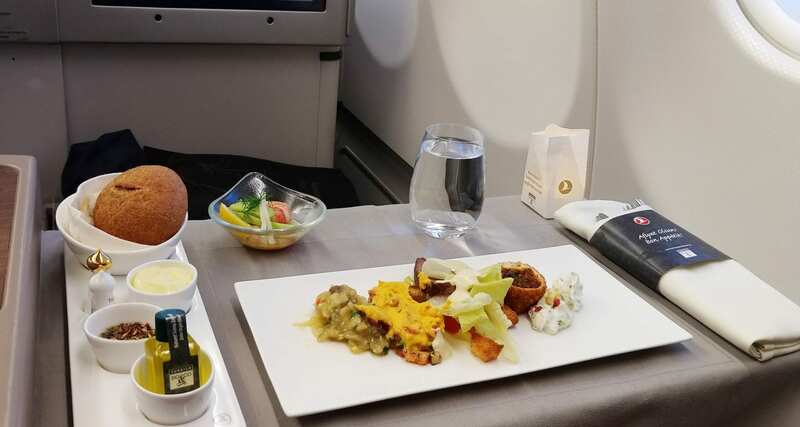 The airline aims to reflect as much of their culture inflight as possible, and this is undoubtedly the case with the carefully crafted inflight food menu and offerings. The chef adds some inflight flair and fun to the dining experience, and it’s always great to engage with them. I won’t comment on the service I received as the airline knew I was onboard the flight as I required filming permission. However, I can safely say that the other passengers enjoyed themselves, and looked as though they too enjoyed the delicious meals. I paid for my ticket and received an upgrade to film and create this story.